Santoshi Mata Puja Vidhi with Mantra – How to Perform Santoshi Mata Puja at home? Santoshi Mata puja is performed to achieve happiness, peace, prosperity and for desire fulfillments. Here is a brief idea on how to perform Santoshi Maa puja at home. This procedure or puja Vidhi also contains the mantra. The puja is also performed for early marriage of children, improvement in business, for success in exams and interviews. How to Perform Santoshi Mata Puja at home? Take bath and wear white color dress before starting the puja. The puja should be performed on the north side of the house. You should also sit facing north. Put a cream color cloth in the puja area and keep sculpture or photo of Santoshi Maa on it. Light lamp using cow ghee – dip the wick in fragrance or apply perfume (Itar) before lighting the lamp. Offer white and red color flowers. Offer red color or sindhoor. Offer kheer or sweet made using rice. After the puja this should be shared with family members and others. Take 16 grains of uncooked rice and mix it with turmeric. Keep the mixed grains firmly held in the left hand. Take a chandan or glass bead mala and chant the following mantra 108 times. After chanting the mantra, the rice mixed with turmeric should be put in red color cloth. The cloth should be hidden in the north side of the house. Channa and jaggery kept on kalash should be offered to a cow. The water in the kalash should be sprinkled in the house. Rest water should be poured under a peepal or neem tree. Make sixteen knots of the thread offered to mata and wear it on the right hand. 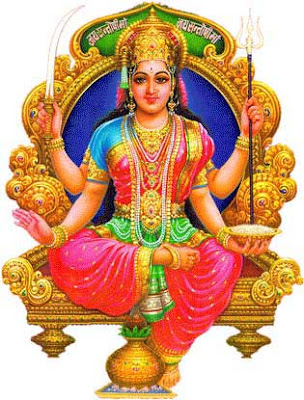 When to Perform Maa Santoshi Puja? You should not touch or eat sour items on the puja day. Sour fruits too should be avoided. Curd, tamarind, mango and tomato should be completely avoided.